1. Will that rip off if I hit a bump or pull out of a slanted parking lot? We have a lot of those here. 2. Will the wheels or rims rub against the car a lot with the suspension lowered like that? 3. Will this decrease the reliability of the car? I mostly just want to know if I have going to have to drive really slow everywhere to avoid ripping the kit off or damaging anything. I also want to know that question about the wheels too because they seem really close to rubbing things. I really like the way this looks, so if I could get more informed about this stuff I would be more confident about doing a mod like that. It looks awesome. 2. Shave your rear fenders. 3. Reliability might be the same as stock. I am assuming this CU2 has a Mugen front bumper and side skirts with a Modulo/Sport rear bumper. Just don't drive your car and or drive fast, you should be all good. 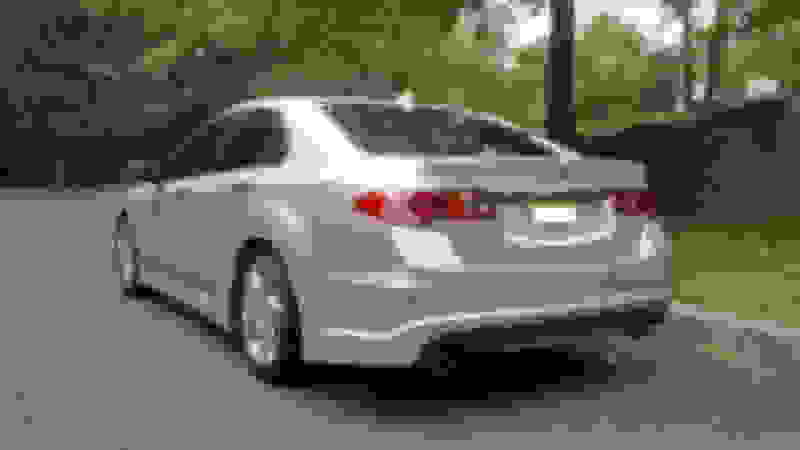 You have a 2014 White TSX. The rear OEM Sport bumper comes prepainted for most colors but can't remember if it does for your white color. This is how it looks in my 2013 TSX SE (way better than the OEM SE bumper) and it is an easy swap (also, my car is lowered on TEIN coilovers). The side skirts came with the car as part of the SE trim. There is also a Sport front bumper but requires using the older style fog lights with that bumper and the color availability is less than the rear sport bumper (doesn't come in my color). This has prevented me from going forward with the front OEM Sport bumper. Where did you get that rear bumper! I LOVE IT.. It is such a weird coincidence that the thread got bumped today because I was literally looking at kits today. I think i had rather get a body kit than anything else. They look great. Can you link me to some options? I know there arent many, thats for sure. CarID doesnt have much other than some lips. But the lips literally are just little black parts, they arent near as good as that SE side skirt. I called acura and they said I could get the whole special edition spoiler kit for 2k but that doesnt include installation..
Can you link me to some options? I called acura and they said I could get the whole special edition spoiler kit for 2k but that doesnt include installation.. I got my sport bumper from an Acura dealer in 2016 when I bought the car. I can't remember what I paid for it back then but I negotiated free freight which is a large chunk of any body part purchase. I had also purchased the full A-Spec kit from the same dealer way back for my 04, again with free freight. The installation of the sport bumper and side skirts is very straightforward (see attached instructions). Don't get the "full" SE spoiler kit. The rear bumper is terrible and that's why I got the sport bumper to replace it. You may not want the front "spoiler" either which is nothing but two pieces that attach to the corners of the front bumper (see instructions). Sweet! Thank you for taking the time to shoot those links. I will give them a call asap! I think body is going to be my main focus. Performance is too expensive for me right now and I don't want to risk reliability. I just got some black wheels and they literally changed the whole look of the car and inspired me to add a body kit eventually, as a finishing touch. I would mind getting a tune and maybe some simple bolt ons but I think that would suffice. I mostly just drive on side streets in the city, so the power she's putting out now is plenty. That combined with the maneuverability is certainly a fun and reliable ride. I love having that handling in the city. Also since it is fairly small I can park and get around people more easily. Would the kit accessories make it more likely to do damage when hitting pot holes or affect daily driving? The roads here are pretty bad but since I got new wheels I am trying to be a little more careful.. but I am sure it is just a matter of times before they get scratches and stuff. Yo I found a bunch of the parts on new acura parts! A lot of them are painted already. Would it be a possible DIY job if I got these parts pre painted and had a friend that was fairly good with cars to help? you missed out on a tasty sale from Acura (Bernardiparts). I got my OEM aero for like $750 shipped. Main part of the sentence being YOU. You're driving. The answer just depends on how you plan to drive and where you're driving it. The OEM aero is MASSIVELY durable, however. So as long as you're not unreasonably dense, you shouldn't have issues. Lowering a car also makes it succeptible to hitting stuff on the ground because its closer to the ground. BUT also makes it less succeptible to attacks from above. Shells that would have hit your roof line will now sail over it. So...think of it like that. Usually, when you do any of these types of mods, you are aware that you made them. If you lower the car 2", you now know that you won't clear the bump that you coasted over with only 1" of margin the other day. Unless you did it whilst sleep walking...in which case, you'd have no recollection of anything until you're slammed up against the curb wondering if you should probably get some help for your condition. very well said.. that was exactly the answer that I was looking for! Love the Avatar pic, Matt! Need pics of stock TL-S w/body kit and H&R OEs on TL-S w/body kit! Body Kit! Body Kit . . .any news?